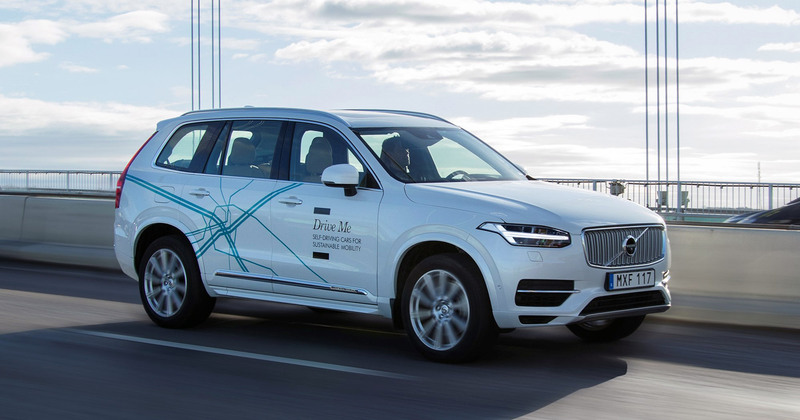 The Volvo Cars Drive Me is a large-scale autonomous driving project, where Volvo Cars put real people behind the wheel of state-of-the-art Volvo XC90s on public roads. In 2018 Volvo Cars will have 100 self-driving cars on the roads of Gothenburg. These state-of-the-art Volvo XC90 SUVs are produced at the Swedish Torslanda auto plant from materials supplied and moved to each welding cell in the welding line by multiple Automated Guided Vehicles provided by AGVE, all controlled by AGVE’s industry leading control system, Best AGV Manager. AGVE foresee a long-term partnership with Volvo Cars supplying a variety of Automated Guided Vehicles. Now AGVE have supplied this sophisticated material handling system based around dual drive AGVs customized for Volvo’s unique material racking and developed for optimum safety in the manufacture of the new Volvo XC90, XC60, V90 and V90cc. The racks to be carried are substantial in size and weight, so the AGVs have to be large as well as agile. The whole fleet operates in perfect synchronization by deploying a sophisticated dual drive system on each Automated Guided Vehicle and AGVE’s Best AGV Manager. The perfectly tuned drive control enables the AGVs to turn in the tightest locations making best use of all the available space. This fully automated solution ensures every vehicle has safe clearance to the next vehicle and the fixed equipment. Certified personnel detection ensures that people are fully protected. By optimizing the AGVE dual drive system even large AGVs can be effortlessly guided to come to a precise stop parallel to the machine drive chains for perfect loading/unloading time after time.